Traveling alone can be a scary thought, especially if you’re a newbie (like me!). Going all the way to the other side of the world to a country you really don’t know much about? Well that just sounds downright crazy. Unless you’re headed to the WTA Finals in Singapore! Hitting the road alone is far less frightening when you have an event to attend. Sometimes there’s comfort in having structure. My partial selfie game is on point. 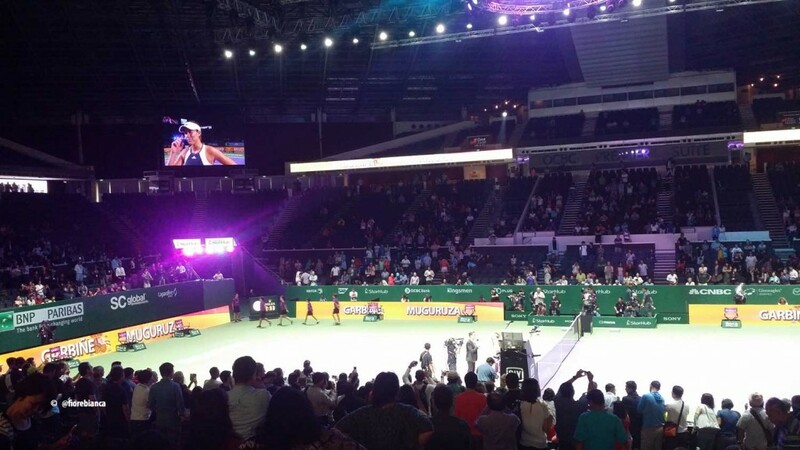 The Singapore Indoor Stadium is not a very large venue (12,000), so it has a very intimate feel; which perfectly suits tennis. My seats were in middle section, to the right of the umpire’s chair. It was always dark inside the arena, but from what I could see, it didn’t look like there was a “bad seat” in the place. In addition to this being my first WTA live event, this was also my first round robin event of any kind. Just after I booked my hotel, I purchased the Monday Session (day 2) ticket through Viagogo. Since I didn’t live in Singapore, I couldn’t purchase tickets directly from the tournament. Monday’s session consisted of four matches (doubles, singles, singles, doubles) and it started at 4pm. Face value was $71.90, but after booking fees (3rd party site) and handling fees (even though I printed an e-ticket), it cost me $90.02. In US dollars, that came out to $64. I purchased a Friday Session (day 6) ticket on the grounds when I went on Monday, and paid $99 ($71 USD). But I wish I’d done more research! I ended up seeing the same group twice. Though, I chose Friday purely because I knew I had to check out of my hotel that morning and get to the airport by 9pm. There are more expensive seats in the section below mine in the (though based on my view, they don’t seem worth the price), and less expensive seats on the upper deck. Day session tickets were about $60 ($43 USD) and night session tickets, which included a Legends match, were about $95 ($68 USD). And you could sit in the upper deck for as little as $17 ($12 USD). 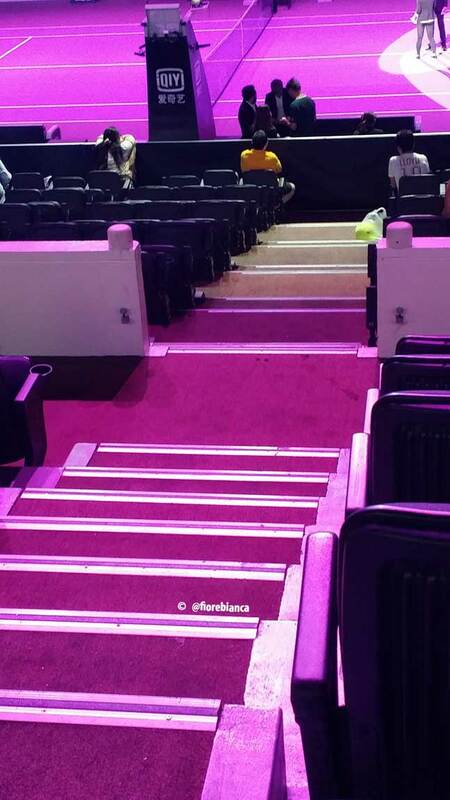 Who puts carpet in an arena? The stadium itself looked good from the outside. But once you went through a very thorough bag check, the interior seemed every bit as dated as its 1989 renovation. There was dingy carpet, upon entering, people are funneled directly into heavy red curtains (like in many a Broadway theater) that are flanked by cash only concession stands that sell the usual stadium treats. Once you part the curtains, you’re right at the railing for the middle level. 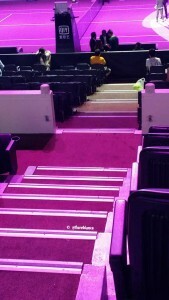 Each aisle is closed off with a gate and watched by an usher during play. They unhinged the gates at every changeover, which makes the most annoying creaking sound you’ve every heard. When you get hungry, you’re not bound by the minimal concessions. The stadium is just a stone’s throw away from the Kallang Wave Mall. For the non-adventurous eaters, you can find a Burger King, Popeye’s, Marble Slab Creamery, and a Smooth King. For the rest, there’s a plethora of delicious food from sushi, to curries, to a large pastry shop! Find the place with the line out the door, and you’re good to go. Between the mall and the stadium is where all the WTA fun can be had. There’s a fan zone, a merchandise tent, and several sponsor booths, all brimming with very enthusiastic folks beckoning you to stop by. I never made my way to the practice courts, but they are close! I was probably more concerned with getting inside to where there was ample A/C. So much so that I nearly froze on Monday because I didn’t have a jacket. I had wised up and brought a light jacket by Friday. The easiest way to get there is by MRT (subway). There is a “Stadium” stop on the Circle Line (yellow line) that drops you right in the fan zone. There’s even a scrolling marquee in the stadium that keeps you informed of when the last trains depart from the station. I spent a week in Singapore and got around absolutely EVERYWHERE with my “tourist card.” $46 SGD for unlimited rides on both the MRT and LRT (trains) and the local buses. The only place I had to get a separate ticket ($4SGD) was to go to Sentosa Island; where I went zip-lining through the trees and spent some time playing in the sea and lounging on the beach! I crowd-sourced travel tips and advice, and everyone I spoke to said that Singapore was a city that was always on its best behavior. I lost count of how many people told me not to chew gum or spit on the sidewalk. I found that the locals are quite orderly. Their subway tracks are completely enclosed behind sliding doors, their stations are immaculate, and the trains are the cleanest forms of public transportation I’ve ever seen in my entire life. Have I mentioned that everyone is always on their phone? Everyone. Yes, the woman who looks like she’s seen both world wars and the kid who is barely tall enough to get himself onto the seats. I never felt unsafe while I was walking the entire city. I stayed at the Wanderlust Hotel, which is in Little India. Fabulous, eclectic place with some of the friendliest staff I’ve ever encountered at a hotel. Singapore is full of districts like Little India, the Arab Street District, and Chinatown. In walking through these areas, it was clear to see that food was not just a meal. There were very few people eating alone and most of these hole-in-the-wall restaurants didn’t even have real menus, but they were filled with tables of jolly people laughing and talking loudly over mounds of delicious looking food. As for the weather, it’s humid. It’s hot and humid and you’ll sweat, and it will be uncomfortable. And you’ll be the only person sweating because the locals are just too cool to sweat. If you sweat enough, locals will feel sorry for you and offer you water and an extra helping of rice to go with your curry because “you look like you need it.” Cooling wipes and a hand towel are necessary travel accessories for when you’re out and about. Oh, and don’t forget your bottled water. Is this Lothlorien? Can I move here? In addition to tennis, I got quite a bit of sightseeing in. 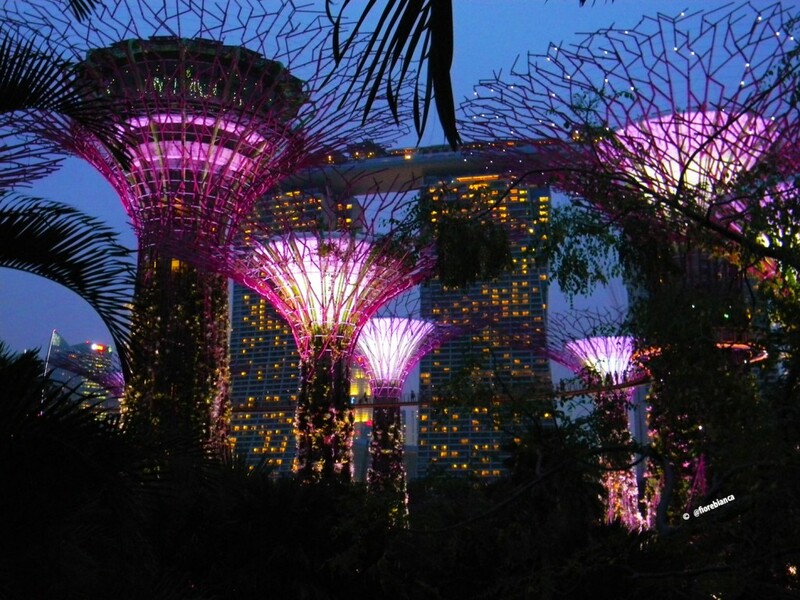 My favorite thing turned out to be the Supertree Grove at the Gardens by the Bay. I knew this area, which is near the famed Marina Bay Sands, would be lit up at night. What I didn’t know was there was a light show in the trees each evening. Can you see the tiny specs that look like people walking among the trees? That’s the skyway, and it only cost $5SGD to go up there. While I was on the skyway, the light show started, and we were treated to a pretty fantastic light show in the gardens set to Disney music. By the time Friday rolled around, I was a little sad to be leaving. There were a couple of things I wish I’d done, but I have to say I’m completely satisfied with my week in Singapore! 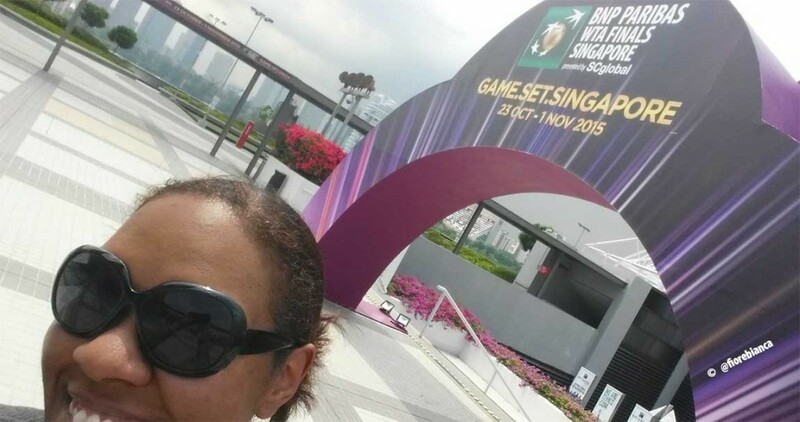 It was my first time in Asia, my first time traveling alone, and my first live WTA event. 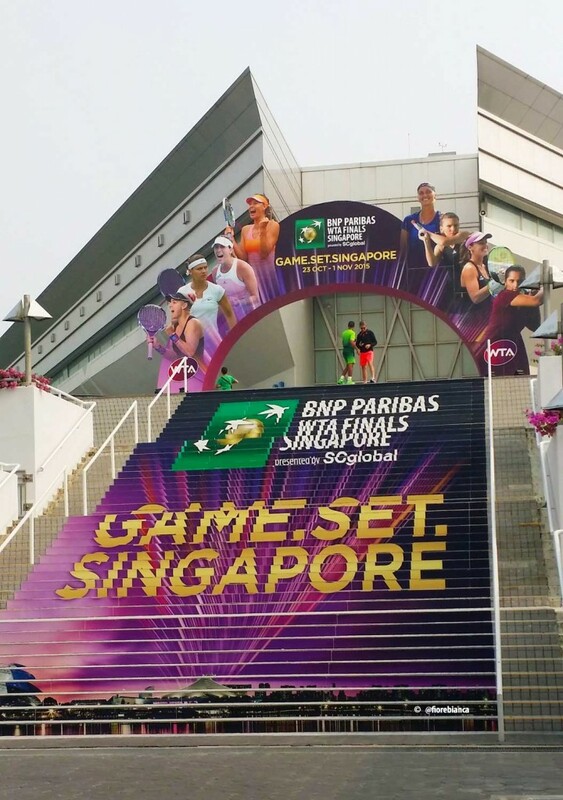 And while I’m unsure if I’ll be heading back any time soon, I will say that Singapore ignited a spark and I’m already planning my next big tennis adventure! 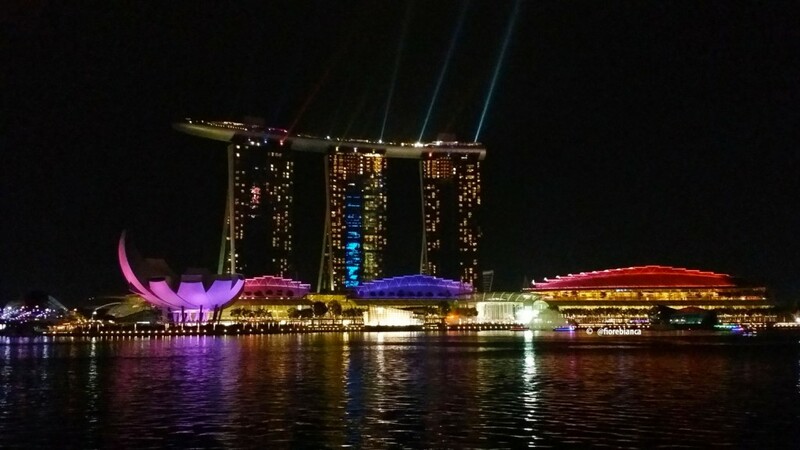 The Marina Bay Sands, all lit up! If you’d like to hear even more about Singapore, check out the RealzTenisFans Podcast where I was a guest on episode #32!